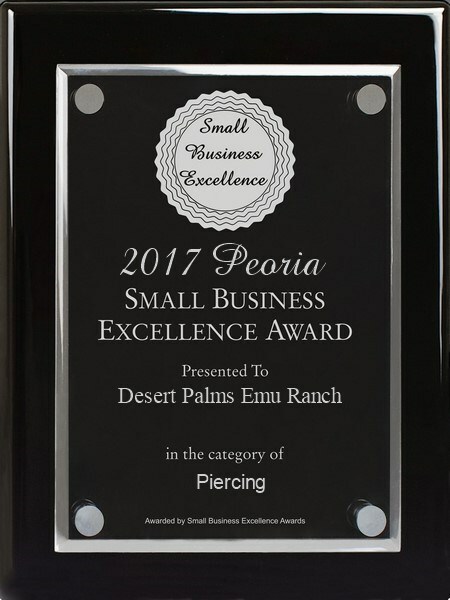 Desert Palms Emu Ranch, LLC, is the first company to introduce Emu oil, and Emu oil aftercare products to the tattoo and piercing industry. Our company set the standards for safe and effective Emu oil as a viable natural alternative to aftercare. Our oil is the only oil that Elayne Angel, President of APP, and author of "The Piercing Bible", uses and endorses. We are the only Emu oil related aftercare company that has been a corporate sponsor in good standing with the APP and have attended their annual convention in Las Vegas since 2005. Thank you for supporting us, as we provide and support you and the industry. The Peoria Small Business Excellence Awards rewards outstanding small businesses that serve their local area. Each year, our selection committee selects companies that we believe have achieved outstanding marketing success in their business category. These are small businesses that enhance the positive image of small businesses through service to their customers and community. International orders will be charged additional shipping costs. 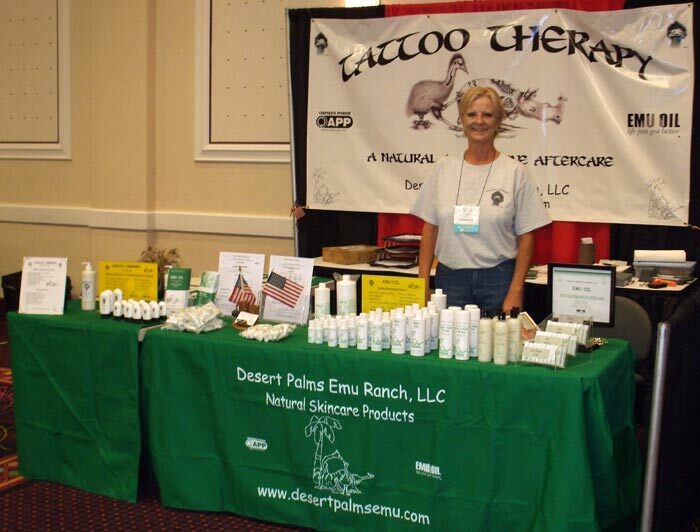 Desert Palms Emu Ranch emu oil is a natural alternative to aftercare for piercing and tattoos. Our oil is refined using a non-chemical process to get out all the impurities. Our oil is fully refined and is suitable for pharmaceutical usage. (not all emu oils are) Even though it is an oil, it has been proven that emu oil does not clog the pores, therefore allowing the skin to breath during the healing process. (unlike most commercially made aftercare products that are petroleum based) Studies have shown that emu oil penetrates through all layers of the skin and is rich in nutrients (essential fatty acids) that feed the skin to aid in new cell development that can help hasten the healing process. 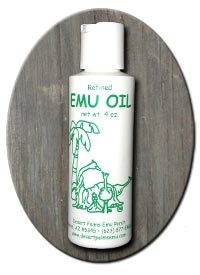 Emu oil is also a natural emollient keeping the skin moist and pliable. Apply emu oil immediately after new artwork has been cleaned to relieve the discomfort and reduce the inflammation and redness. Emu oil will help set the colors (due to its deep penetrating properties) and will help reduce plasma oozing. Using emu oil 2-3 times a day during the healing process will keep the area moist, reducing or eliminating the flaking and/or scabbing that often occurs. Emu oil can prevent the need for touch-ups which saves the artist time and money, and makes for a happy customer. Note: apply emu oil only to clean skin. 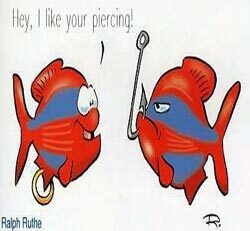 Apply emu oil 2-3 times daily after the piercing has been cleaned. Gently massage a single drop of emu oil around the opening of the piercing (entrance and exit) with clean finger. 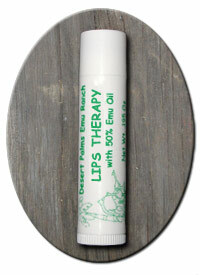 Desert Palms Emu Ranch emu oil is safe to use on tongue piercings, labrets and genital piercings. 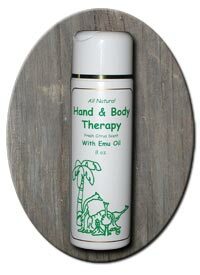 Apply emu oil daily as needed on clean surface with clean hands. Emu oil will keep area moist and pliable. Helps prevent tears and blow-outs on ear stretching. Put a drop of emu oil on larger gauge jewelry before insertion to ease discomfort and increase slide. Comes in 1 oz. ($9), 2 oz. ($17), 4 oz. ($28.50), and 8 oz. bottles($50). NOTE: Emu oil comes from a layer of fat off the back of the bird. It is one of the by-products of the animal when it is processed. Emu oil is NOT a Vegan friendly product. Most vegetarians will use emu oil because 97% of the bird is utilized (meat, hide, carcass, organs, feathers, fat). Also, emu oil should not be used on scarification or branding as emu oil hastens the healing process and inhibits scabbing. Natural aftercare salve enhanced with Emu Oil and formulated to aid in the healing and comfort of new artwork and permanent cosmetic procedures. ™ has natural healing agents, anti-inflammatories and skin moisturizers blended together with the deep penetrating properties of Emu Oil. ™ has a natural moisturizing barrier to help prevent skin from excessive drying and flaking, and yet still allows the skin to breathe during the healing process. ™ helps soothe the skin immediately upon application. It helps reduce redness and swelling and provides comfort and healing to the skin. To Use: Apply a very thin coating of ™ over clean surface 2-3 times daily, or as needed, during the healing process to keep area moist and comfortable. ™ can be used in conjunction with Emu Oil or alone. If used with Emu Oil, use Emu Oil for the first two days. Then use ™ for the remainder of the healing period to prevent dryness and excessive flaking. New and improved formula with more moisturizers and skin conditioners. Helps prevent dry, flaky skin. Good for all skin types. Contains no perfumes or fragrances. Lightly scented with citrus essential oils. Use Hand & Body Therapy after new artwork has healed to maintain moisture in the skin and to keep artwork looking new. Brightens and enhances older artwork. Emu Oil brings the moisturizers and conditioners deep into the skin for a long lasting effect. Use sparingly, a little goes a long way. Apply once a day to clean skin. Comes in 4 oz ($5.50) or 8 oz bottles ($10). Tattoo and Piercing Starter Kit - Comes in sturdy plastic pull-tie bag and contains 6cc Emu Oil, 1 oz Tattoo Therapy, 4 oz Hand & Body Therapy. I'm so glad to support your business and very happy that emu oil has become so popular in the body art industry. The products are tremendously effective and really speak for themselves. I'm just helping to spread the word. For the care of healing and troubled piercings, emu oil has proved itself superior to all the other products I’ve advocated throughout my career. Yes, emu, as in the big flightless bird. Aboriginal people in Australia have used emu oil on wounds for centuries. Today it is used by massage therapists, dermatologists, other medical practitioners, and piercers, for its anti-inflammatory, pain-relieving, and wound-healing properties. 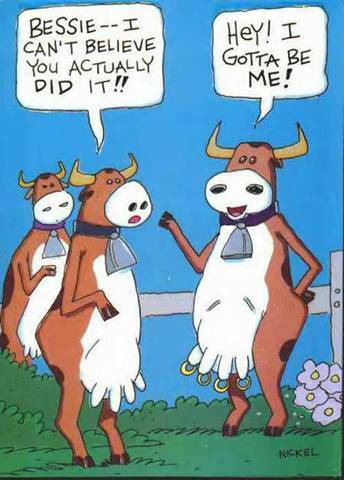 I believe emu oil is safe and effective enough that it could become the norm for post-piercing care, at least among non-vegetarians. I know I’ve advised against miracle products, but if there is such a thing, in my opinion, emu oil is it. Emu oil is high in essential fatty acids and keeps your skin moisturized. This establishes favorable conditions: healing is three to five times faster and less painful in a moist environment. Pure emu oil does not clog pores, and it does not prevent air circulation like petroleum-based products. The emollients help keep secretions from drying and adhering to the skin or jewelry, which cuts down on crusting, trauma, and discomfort. Even though it is called “oil,” it is more like a lotion. It rubs in well and does not leave a greasy residue. Emu oil feels extremely soothing the instant you put it on. These pleasant attributes help to encourage regular applications. You can use it in conjunction with saline soaks, though many piercees have had excellent results healing with emu oil as the sole care product. Studies have shown that emu oil penetrates the skin, which resolves any debate over rotating the jewelry. All prices are USD. Additional shipping charges will be added to your total order. 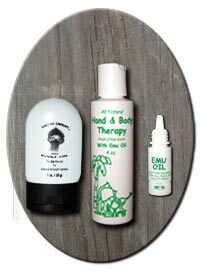 We offer Emu Oil in special packaging and pricing to the trade. Please call or email for access information. If you already have a username and password, please go to this page to login. See what Dessa, owner of Tattooz by Sassy has to say about emu oil. 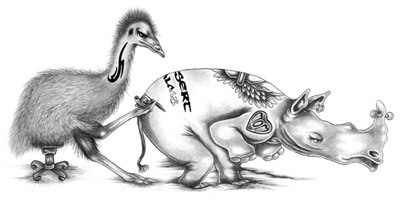 See what was printed in Pain Magazine by Elayne Angel, President of the APP, about Emu Oil For Post Piercing (and tattoo) Care. View the article written by Elayne Angel, President of the APP, in "THE POINT." Click on Issue 31 and go to page 6. The statements made within our website have not been evaluated by the FDA. Desert Palms Emu Ranch LLC makes no medical claims expressed or implied.